So, I'm kind of a sucker for Best Buy's Deal of the Day. It's not so much that the prices are that low -- although sometimes, for some items, they really are -- but they often draw my attention to products that I might not ever consider buying, or even know about. I've been known to pull the trigger on a "deal" simply to see if the hype is warranted. 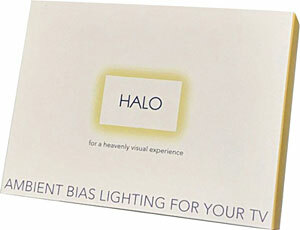 A couple of weeks ago, one of the DOTD was a half-price sale for something called a Halo Ambient Bias Lighting kit for TVs. I had never heard of this but I did some research (aka "clicked on a couple of google results") and was persuaded that it was a legitimate technology for improving the picture on a typical flatscreen television. This is a good overview of the technology and why it works. The theory is that when a TV screen is subjected to ambient light of the proper color temperature (for modern HDTVs, it's 6500K), your eyes will perceive the picture to have greater contrast, and they will also be less susceptible to strain due to the increased brightness of the typical LED TV. The ambient light tricks the brain into thinking the TV isn't as bright as it really is, and this makes a difference in viewing comfort, especially if you're watching in a darkened room. I figured that for seventeen bucks, it was worth checking out, so I ordered two of them, one for the living room TV and one for the screen in our bedroom. The kits arrived last week, and I finally got around to installing them. The units are elegantly packaged, rivaling some of Apple's packaging, and the installation instructions are easy to follow. I think they could be improved by explaining exactly how Halo improves the viewing experience, but I suppose they assume that you wouldn't be using the product if you didn't know what it did. Installation is simple, taking less than five minutes, although it requires access to the back of the TV. The Halo is simply a ribbon of LED lights that are affixed to the back of the TV via peel-and-stick. The unit is USB-powered (USB 3.0, to be precise). Ideally, it's plugged into the USB port on your TV so that it turns on and off along with your TV. If that's not an option, you'll need an USB adapter to plug into a regular electrical outlet; the Halo comes with a remote control so you can operate it independently of the TV. 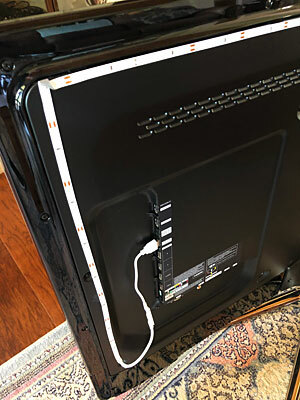 The photo at right shows the installation on one of our TVs; the white strip contains the LED lights, and it's plugged into the TV's USB port. I mounted the Halo on three sides of our TVs, starting and ending about two-thirds of the way down the sides. If you have a TV mounted flush to the wall, you may need to run the strip all the way around it to get an effective ambient light effect. It's important that the light from the LEDs is reflected around the TV to get the desired effect. Even if you use your TV's USB port and thus don't need the remote to activate the Halo, the remote still has some useful features, as well as a few inexplicably weird ones. The useful ones are the controls that allow you to adjust the brightness of the LEDs to suit your viewing taste. The weird ones let you turn the Halo's lights into a variety of flashing sequences. I can't imagine a scenario where you want to send a continuous SOS signal from behind your TV, but perhaps I'm living in the wrong neighborhood. I must admit to thus far being underwhelmed by the difference Halo seems to make on our TVs. For one thing, both units are mounted in cabinets, and the lights illuminate the back and sides of the cabinets, as well as any cabling or A/V components that might normally be hidden in the dark recesses. And in one case, the TV almost completely fills the cabinet from edge-to-edge, meaning that there is negligible ambient light spilling over from the two sides of the TV. That's not to say that the Halo doesn't work; we just haven't noticed much difference when watching TV at night in a dark room (which we rarely do). At the same time, the ambient light is not a distraction, and we may find that we like it more as we get accustomed to it. For now, we're operating it at the lowest brightness level. In the end, at $17, the Halo is not a bad investment; it's a little more iffy at twice that price. But if you normally watch TV in a darkened room and if you experience eyestrain, it's worth checking out. This page contains a single entry by Eric published on June 14, 2018 10:06 PM. Clash of Species - Woodpeckers vs Snakes was the previous entry in this blog. Wildlife Update is the next entry in this blog.